WCDMA Iu PS Interface wcdma iu control plane protocol stack plane protocol user plane transport network protocol structure ps interface network control and signaling. Here I write about Iu PS Interface in WCDMA. The Iu PS protocol structure is represented in below image. Again, a common ATM transport is applied for both User and Control Plane. Also the physical layer is as specified for wcdma Iu CS. The WCDMA Control Plane protocol stack consists of RANAP, on top of Broadband (BB) SS7 Signaling System 7 protocols. 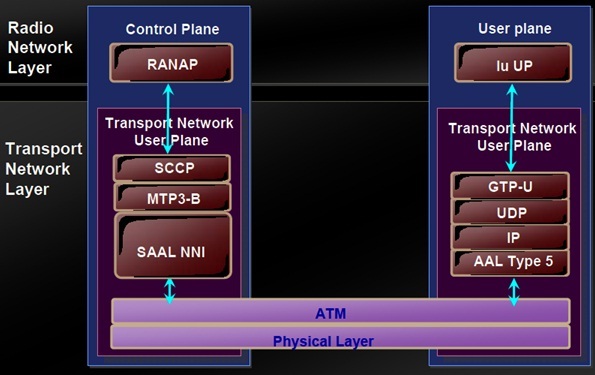 The applicable WCDMA layers are the Signaling Connection Control Part (SCCP), the Message Transfer Part (MTP3-b) and SAAL-NNI (Signaling ATM Adaptation Layer for Network to Network Interfaces). The Transport Network Control Plane is not applied to Iu PS. The setting up of the GTP tunnel requires only an identifier for the tunnel, and the IP addresses for both directions and these are already included in the WCDMA RANAP RAB Assignment messages. In the WCDMA Iu PS User Plane, multiple packet data flows are multiplexed on one or several AAL5 PVCs. The GTP-U means User Plane part of the GPRS Tunneling Protocol is the multiplexing wcdma layer that provides identities for individual packet data flow. Each flow uses UDP connectionless transport and IP addressing. 26 queries in 0.444 seconds.